Great to see a positive review of a hotel i find delightful - an opinion shared by very few! but i understand the comment regarding location: if you want to stay "on brand", the HI Express is just fine. Yes but not quite as happy as I used to be. I was this hotel's very first guest when they opened in Oct 2017 and have stayed here about 15 times since then. Modern, with a great view of the wharf and Potomac River. The King Promenade is standard sized, on the 4th floor but has a really nice patio with a table and chairs. ​​​The Royal Ambassador breakfast is the buffet only, which is small and on a side table but not bad. The hot items include scrambled eggs, potatoes (which are amazing), meat, oatmeal, sunny side up eggs (individually portioned). You can order pancakes or waffles from the server. There are also pastries and individually portioned fruit, yogurt, granola, avocado toast, smoked fish. A few beers, Johnny Walker Black, Tito's vodka, gin, 375 ml bottles of red and white wine, sparkling water, mixers. However, with the tax and service charge, a $32 bottle of wine will max out your $50 daily limit! Also, on 3 of my last 4 stays here, the minibar has been locked and the front desk hasn't been able to remotely unlock it. It has taken 1 to 2 hours to get someone to come up and unlock it. This hotel is not good about refilling it, either. On 2 night stays, it never gets refilled. Apparently, I exceeded the $50/day minibar by $1 one day, but when I checked out, they just took it off the bill. Yes, generally. I usually stay here a few times a year. Booked Superior Room at Government Rate. Received 1 King Bed Executive Suite. The Executive Suite has a separate bedroom and living room with 2 full baths. The living room has a sitting area plus dining area. The rooms have recently been redecorated and they are a little more modern now, but I feel they don't have as much character as they used to. Nespresso maker in the room, which I love. ​​​The Royal Ambassador breakfast is the buffet or anything from the menu. I chose the buffet both days, which also includes cooked to order eggs. The buffet is really good with a lot of options and variety. Nope - prior to 1 Feb, this hotel used to give RAs a full size bottle of red wine and a few times I also received a tin that looked like the Willard with cookies in it. They do not give the bottle of wine anymore (I double checked when I checked out.) I did get fruit -- I received a plate with 3 red delicious apples and a small bowl of dried fruit and nuts. This hotel used to give out a fantastic fruit plate, so this was a little disappointing. Plus received a few bottles of water everyday. The minibar at this hotel is one of the best! 375ml bottles of red and white wine and champagne, 2 local IPAs, 2 Stellas, vodka, JW black, gin, bourbon, and tequila, plus mixers. This exec suite had 2 minibars, too, so I was definitely missing free minibar on this stay. With the tax (10%) and service charge (15% then tax gets added to the service charge), a $40 bottle of wine ends up being $50.60. The hotel waived the 60 cents when I checked out, though. The champagne is $65 so not in the RA limit. The upgrade from a Superior Room to Executive Suite. The extra 60 cents was removed from my minibar charges - yay! They are sticking to the new rules with no more welcome amenity for RA. The fruit they brought up was disappointing, this hotel used to provide one of the best fruit plates. They add tax to the minibar service charge (yeah, it's not a lot but still...). Yes. I usually stay here once or twice a year. Booked King Deluxe, received King Executive on top floor. The King Exec is a regular room on a high floor and it's on the small side. The bathrooms are fairly spacious though. As multiple people have posted here, this hotel no longer upgrades a basic room reservation to a suite or corner room like they used to do a few years ago. Pretty good. The cocktail hour is from 5pm to 8pm and has self serve beer, wine, liquor and a decent variety of appetizers (cheese/crackers, veggies, one hot item, multiple cold items individually portioned). Breakfast is better than it used to be - they added hot items back in (scrambled eggs, scrambled egg whites, bacon/sausages) and have a variety of bread, pastries, fruit, smoked salmon, cold cuts, cheese. Just fruit and a small bottle of water (same as before 1 Feb, I think but without the dried fruit and nuts they used to provide). The fruit plate was really good with a variety including strawberries, blackberries, a kiwi, a peach and a plum. The minibar was still pretty good. 375ml bottles of red, white and sparking wine, beer, vodka, Macallen whisky, gin, bourbon, and tequila, plus mixers. The best part about the minibar is the prices are very reasonable (especially compared to the DC ICs) and they don't charge tax or service charge!! When I checked in, the front desk agent provided that info and it wasn't listed on the minibar price list. It's amazing how happy that made me. FLYGVA and #1son like this. Nice to see an IC playing fair with RA minibar credit. As RA, whilst aware minibar menu prices may/may-not include vat/service, I had neber noticed in many many stays a restocking (per day) fee. One wonders as RA if some IC's have recenty invented/added such fee to degrade RA's $50 credit. As an aside, what if a guest just drank 1x evian/soda, menu priced $5, then bill expected by guest with service 10%+tax as $6-7, and on checkout charged usd22 due to sneaky $15++ restock fee. Such fees are utter tripe/nonsense. The rooms have been refreshed a few years ago. The suite comes with a sitting area with TV, writing desk as well as the bedroom with another TV. Lounge is nice and staff are friendly. There is a reasonable selection of finger food and noodles in the evenings. Have not tried the breakfast as I have used the main restaurant in Level 1 during breakfast. The restaurant in Level 1 offers a good selection of both Asian and Western food including an egg station and noodle bar. Staff are friendly too, but restaurant can get very busy during peak periods. A few beers, orange juices, mineral water and wine and some small bottle liquor. Nothing to shout about. - Excellent location especially if you need to be in Pudong area. It is near the financial area (Lujiazui) with less than 10min taxi or train ride from hotel. Hotel is also near the Century Avenue Station which connects to Line 2, 4, 6 and 9. Line 2 can take you to Pudong International Airport. - Staff are warm and friendly especially those in the restaurant, housekeeping and in Club Lounge. - Though the hotel has been refurnished a few years ago, it is starting to show signs of wear and tear and carpet at common area probably need a change. - Hotel wifi will not allow you to access Google Services, LINE and whatsapps as well as Facebook, amongst others. - Despite staying there a few times, each time upon check-in, they will need to take a facial image for all guests. This tends to hold up the queue. I'm a bit mixed here as the hotel is very strictly applying the new benefit rules and have limited the upgrades to a Sky View Corner as the highest level. 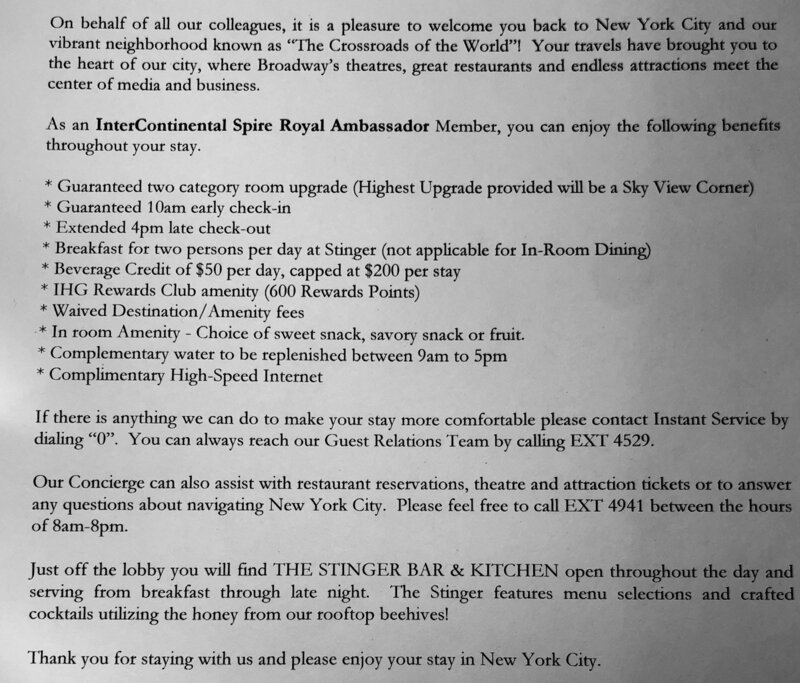 You are also no longer offered a cocktail as a welcome amenity, it's points only. The resort fees are waived for RA's but the benefits are also waived (no $20 F&B credit and $15 laundry credit). They also say the minibar benefit is for beverage only. Fine but relatively small as they are at this property. Quite basic. Five minis plus beer and wine. Staff were all helpful and friendly. The person that checked me in clearly explained the new RA rules. The re-stocking fee on the mini-bar is quite high. Upgrades are now only Sky View Corner max. OK for $300/night. I usually stay at the Barclay as I prefer it and it is usually cheaper. This time they were asking $400/night. Only if the rate is much lower than the Barclay. Looks like loosing RA is a blessing, judging by reports here. all about the "price gouge"
almost USD 7 + VAT for a can of Coke or bottle of water?? over USD 20 + VAT to press a suit? rooms are getting rather tired - 28" TVs in suites? Yes. I stay here at least once year. The Presidential Suite was amazing, over 2000 sq ft. Bedroom had a lot of light and faced the streets (on the corner), the living room and dining room faced the courtyard so they were a little dark. There was a huge balcony, one and a half baths. They don't have one anymoreh but this hotel started providing breakfast for RAs after the lounge closed. Breakfast buffet is decent, several hot items plus made to order eggs and waffles. Lots of fruit, bagels, smoked salmon, pastries. Bottle of champagne, chocolate covered strawberries, chocolate covered Oreo with Fleur de Lis design. Plus large bottle of Fiji water every day and fruit. The minibar was decent. 375ml bottles of red & white wines, local beers, vodka, JW Black, plus mixers . Prices were average ($25 for wine, $8 for beer, $11 for liquor). Tax is 10% and service charge is 20%. After the second day, the automated sensors stopped working (realized this when checking "current charges" on the IHG app). Hopefully, we won't get charged for things after we checked out I did let the front desk know about the issue, though. No robe in the room. Asked at the front desk if they could send one up and they never did. Had to call when we got back to the room later.